Figure 1: A study skull showing maxillary sinus anatomy. At “A”, a thin plate of bone has been removed to expose the maxillary sinus. 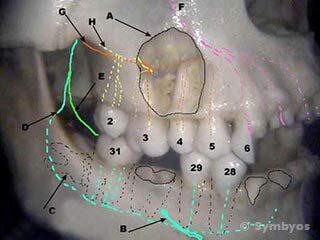 The roots of bicuspid tooth (#4) and molar tooth (#3) are evident projecting up and into the floor of the sinus. The Posterior Superior Alveolar (PSA) nerve branch, (“H”) runs into the sinus and gives sensation to the maxillary molars. This is why sinus pressure can masquerade as a toothache. In a live patient, the sinus floor is lined with a membranous lining called the Schneiderian membrane. The Middle Superior Alveolar (MSA) nerve branch (“G”) provides sensation to the bicuspid teeth (#4 and #5), and most often to at least one of the roots of the first molar tooth (#3). The Anterior Superior Alveolar (ASA) nerve branch (“F”) gives sensation to the upper lip and the front six teeth. The maxillary sinus is a hollow space under the cheek bones, which serves to lighten the skull, while providing a bony framework for attachment of the facial soft tissues. Often, the upper back tooth roots lie in or near the sinus floor (Figure 1). Because of this, the nerves which provide the upper back teeth with sensation may detect pressure changes that occur in the sinus. Changes in altitude and fluid in the sinuses from allergies and infections can apply pressure to the nerves, causing pain. This is important from a dental perspective, because sinus infections can be misdiagnosed as a tooth abscess (and vice versa). Although most sinus issues are due to viruses and allergens (dust, pollen, etc. ), these conditions produce inflammation (sinusitis), which causes fluid to accumulate in the sinus. The chronic presence of fluid in the sinus produces an environment conducive to bacterial colony formation. 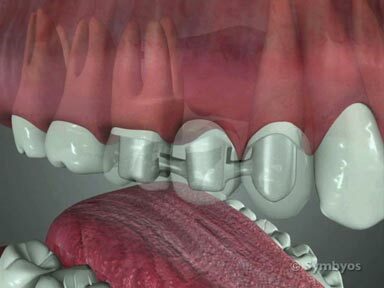 Thus, there is at least a theoretical pathway for bacteria to get into the upper teeth by way of the sinus. How does the dentist diagnose Sinus Infections? Pain in the mid-face, which may or may not be on both sides is typically present. Multiple upper back teeth may ache. The patient will generally confirm a recent / current history of sinusitis, congestion, or other common symptoms of a cold (rhinovirus). Tapping on the cheek bones will produce an uncomfortable resonance, like tapping on a bowl of gelatin. Bending down may increase the pain. The teeth are generally not abnormally sensitive to temperature changes, but may be tender when tapping on them. A periapical or panoramic X-ray image may show cloudiness in the sinus. Sinus infections are typically treated by prescription of a decongestant, an antibiotic, and sometimes an anti-inflammatory medication (steroidal or non-steroidal). Saline irrigation may also be recommended. Follow-up is recommended to rule out dental problems, which may either have led to a sinus infection, or been caused by one. If teeth are involved, it is not uncommon for medications to produce temporary relief, only to have the symptoms return weeks or months later. 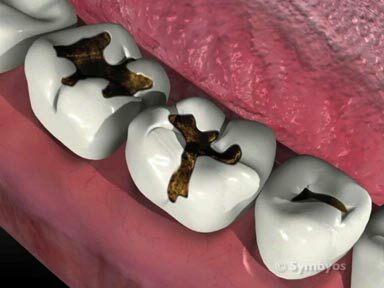 If a tooth is suspected as a cause, it should be vital tested at regular intervals (for example, at one month, three months, six months and then a year) to be sure it remains alive and healthy. 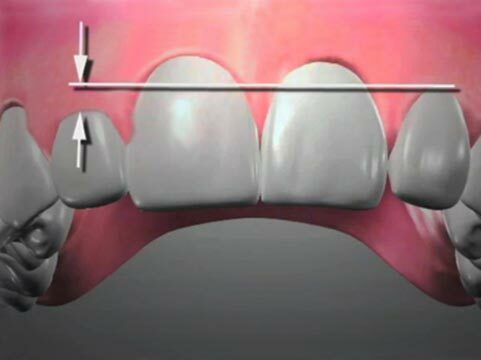 Vital testing involves testing a tooth’s response to hot, cold and mild electrical stimuli. Patients who experience frequent sinus infections due to poor anatomical drainage may be candidates to have the drainage hole on the medial wall of the sinus cavity (sinus ostium) surgically enlarged on the affected side or sides. This procedure is called a maxillary sinus antrostomy, and is typically performed by Ear-Nose-Throat doctors (otolaryngologists), or oral and maxillofacial surgeons.